Colin McLaren’s cold case book into the 2009 disappearance and suspected murder of Bob Chappell and the 2010 conviction of Sue Neill-Fraser for his murder comes after years of agitation and disquiet about that conviction. It’s an itch that won’t be calmed. It’s riveting, infuriating, exciting; I couldn’t put it down. Recognised as one of Australia’s finest detectives, task force team leaders and trainer of detectives – in the 1980s and 90s – McLaren was also an undercover cop, successfully infiltrating the Australian Mafia. He is now a journalist and author. Effectively blending his ace detective and writing skills, McLaren takes the reader on an urgent journey to thoroughly investigate the people and events surrounding the disappearance of Bob Chappell sometime on January 26/27, 2009. McLaren’s decades of experience are neatly contrasted in the chapter describing his interview with the professionally underwhelming (now retired) Inspector Peter Powell who led the flawed 2009 investigation. Ever since the media started asking questions – and there were quite a few of them, from 60 Minutes to 7.30, The Australian and Women’s Weekly to many others right up till today – the Tasmanian legal establishment became aggressively defensive. It began when Eve Ash produced her feature length documentary, Shadow of Doubt, which had its premiere at Hobart’s State Theatre on July 31, 2013. She had spent years making it, showing up the ineptitude of the police investigation. McLaren’s book turbo-charges those criticisms and adds a massive payload in the form of evidence: hard facts, all corroborated. Such as the crucial issue of the DNA of homeless Meaghan Vass, found on the yacht, which the DPP tried to dismiss as having been transferred on a copper’s boot. What the DPP didn’t tell the jury – nor the High Court – was that the DNA came from Meaghan’s fluid, the size of a little puddle (not a tiny speck). And how vital facts led McLaren to a group of thieves who were never – but should have been – considered persons of interest in the investigation. In a nutshell, a yacht break and enter that went horribly wrong. He shows why so many believe Sue Neill-Fraser to be innocent, while the killers are still free. Needless to say, this sort of information makes TasPol fidgety. As we close the book after the last page, all of them filled with evidence, much of it seeing the light of day for the first time, the title Southern Justice takes on its full meaning; it could just as easily be titled Rough Justice. And it’s not over by any means. McLaren will be cross examined on February 5, by the DPP in the Hobart Supreme Court, over his role in a signed declaration he obtained from Meaghan Vass, admitting her presence on the yacht with ‘two men I won’t name.’ He believes his powder is dry. 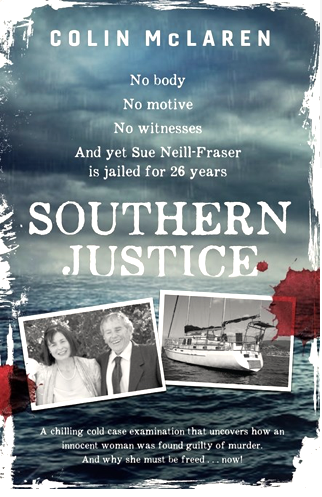 Only then will Justice Brett determine whether Sue Neill-Fraser can run a full appeal against her conviction. And history will be made. Re that “itch” – I note at what must be monumental cost to Tasmanian taxpayers, the ‘system’ has been dispensed with abundant supplies of antihistamines to no avail. The itchy areas have spread.